About halfway down that long line stood one of those people much sought after by reporters and campaign activists  a last-minute undecided voter. Even though she was probably only 20 minutes or so from standing in the voting booth, Amy Ho said she was still wavering about her choice for President. "Obama would probably make more of a positive impact in terms of health care" and other domestic issues, she said. "But McCain might make more of a difference in the war." The 25-year-old lab researcher said she would probably vote for Obama in the end, if only because Sarah Palin was such a poor choice for a running mate for McCain. And the economic meltdown had inclined her even more toward Obama. And yet, even as she stood in line, nibbling from a cup of fragrant noodles, she was "playing the pieces in my mind" about who to vote for. She did consider not voting at all when she first saw the endless line, she said, but she realized "this is going to be a historic election I'm just happy to be a part of it." Election judges in Minnesota are erring on protecting the privacy of voters over the ability for exit pollsters to conduct interviews outside of polling stations. A head election judge at a polling station on the University of Minnesota Minneapolis campus said I could not interview voters within 100 feet of a polling station after they had already voted, saying my activities constituted exit polling. A federal judge in October ruled in favor of media outlets after they sued the state over a law that barred them from conducting exit polling closer than 100 feet of polling stations. U.S. Chief Judge Michael Davis held that the rule infringed on media organizations' First Amendment rights. Judy Schwartua, a Minneapolis training and communications director for elections, said the ruling applied only to the media organizations that sued the state and the precincts listed in the ruling. But Susan Buckley, who represented the media organizations, disagreed. "The ruling is pretty clear. The state cannot prevent exit polling. That's what [the judge] ruled." McCain campaign staff in Orlando monitoring turnout at certain heavily Republican and heavily Democratic  but nonAfrican American  precincts say they are seeing stronger voting activity in the right-leaning neighborhoods. "There is a very clear trend from our bellwether precincts that turnout for the Republican precincts are significantly exceeding [Democratic precincts]," said Lew Oliver, chairman of McCain's campaign in Orange County, Fla. "We think we're running 5% or 6% ahead, maybe as much as 10%. The enthusiasm is just enormous." The campaign specifically excluded from its monitoring precincts the African-American neighborhoods expected to vote overwhelmingly for Obama. In gauging voting activity, Oliver said, the campaign factored in each precinct's early voting and absentee balloting. The campaign has no exit polling data to show who the voters in those precincts are actually voting for. Over at Obama headquarters in Orlando, spokeswoman Laura McGinnis didn't have any comparable data to support or refute the McCain camp. "Honestly, our focus is on getting people to the polls," McGinnis said. "Today, we're getting feet on the street." Anecdotally, McGinnis said, students at the nearly 50,000-student University of Central Florida are getting in line and staying in line even if it takes hours to vote. 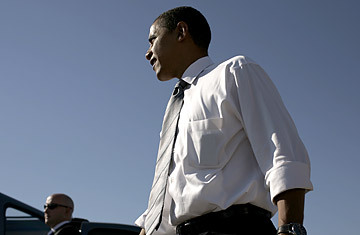 The Obama camp is hoping for strong support from young and first-time voters. Both Republicans and Democrats in Iowa report smooth sailing so far but appear reluctant to sound too cocky. They haven't heard of any major complaints at polling places and are concentrating on turning out voters. "Everything is going smoothly," says Nathan Treloar, the Iowa Republican Party's communications director. There have been reports of lines, especially in more densely populated precincts early in the morning, he says. Republicans have been busy doing the "bare basics, getting out there, contacting voters that we need to turn out and double-checking absentee requests that have not been returned," he says. As for how John McCain is doing, Treloar says, "I don't have any data from the ground to answer that but generally the momentum that the McCain camp has had over the last four days has been extremely good. It's all about momentum and peaking at the right time." And McCain, he says, is peaking. Heavy turnout, he adds, is good for all. "If there are more voters, a lot of those are going to be ours too," he says. "Heavy turnout is good for the election process in general and is not going to sway to one side or the other." Putting a finger to his lips, Heriberto Basurto says he always keeps his political thoughts to himself. That's because the 78-year-old tailor lives in Little Havana, where it's easy to get shouted down if you don't embrace the Republican preferences of the conservative Cuban exile community. But in recent years the demographics of working-class Little Havana have been changing dramatically  and non-Cuban Latinos like Basurto, who hails from Guayaquil, Ecuador, don't feel so much like the minority they were when he arrived in this country a decade ago. Basurto, in fact, has been feeling so emboldened of late that he went ahead and got his U.S. citizenship this year  and registered to vote the same day. So on this overcast election morning in Miami, Basurto, in a neatly pressed shirt and golf cap, was one of the seniors sitting at the Obama campaign office in Little Havana waiting for a ride to the polls to cast a ballot in his first U.S. election. "I like this fellow Obama," he said in Spanish. "I agree with my daughter that it's time for a change around here, and he seems to have a more open mind than McCain." Basurto, who doesn't exactly hail from Ecuador's lily-white élite, is also pleased by the fact that Obama will be America's first black President. "The world likes Obama better too," he adds. "I think he's going to be as popular around the world as the dollar, if you ask me." But it's not just non-Cuban Latinos who are changing Little Havana's politics. A half-century after Fidel Castro took power in Cuba, younger and more moderate Cuban-Americans are coming to the fore in Miami  and their votes could be critical to whether or not Obama upsets McCain in Florida, the nation's largest swing state. One of the young volunteers waiting to transport elderly Obama voters is Hector Martinez, 21, a film major at Miami-Dade College who feels an uncanny bond with Obama. See TIME's video on Florida Hispanic voters. Like Obama, Hector never really knew his father, a Cuban-born radiologist who died when Hector was a toddler. Raised by his mother, a nurse, Hector says he also feels close to his grandmother, who is in her 80s and still lives in Havana. But the tighter Cuba travel restrictions that President Bush imposed in 2004 means Hector can't visit his abuela as much as he used to  and he's voting for Obama in part because the Illinois Senator has promised to revoke the travel rules. "I've been thinking about that a lot since I heard Obama's grandmother died way out in Hawaii yesterday," said Martinez, rubbing the 5 o'clock shadow on his face. "I think enough of us middle-class Cuban-Americans are feeling the same way about things to make a difference today."